He's confident. He's regal. He's got literal cat-like reflexes. What more could you ask for from a leader? With the awesome technology that's made possible by Vibranium, Wakanda seems like a pretty awesome place to live. Everything seems to go smoothly there, well, until the outside world came a-knockin'! T'chala has got to be proud about the large and small issues that his kingdom has ironed out. Take public transport for example. Notice how the bustling capital city wasn't clogged with cars? They've got two versions of public transport; a hyperloop and a streetcar. Yes, Shuri, can cure any illness or injury but they've circumvented the annoyance of rush hour, isn't that more exciting? If any other problems crop up, the kingdom's sharp and handsome king can take care of it! This jumpsuit looks muscley with subtle high-lighted muscles on the abs, sleeves, and legs. There are high-tech looking claws on the foam boot covers, around the sleeves, and the neck. Fighting high-profile criminals will be no problem because it has an elastic band around the shoes. 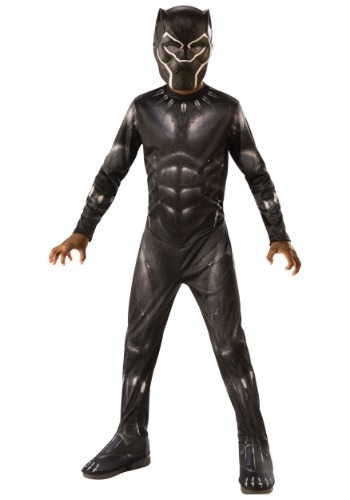 The jumpsuit is secured up the back with hook and loop touch fasteners to make putting on the costume easy. Top off the whole look with a molded mask with eye-mesh holes and silver accents that would absorb the energy from impacts that would be mortal to any lesser man.